FRAMES. The simplest frames for bead work are made of two blocks of wood, one inch in width and thickness and three inches long, one square inch by three inches, and two half inch boards two inches wide and two feet long. A double row of brads are nailed into one side of each block, one quarter of an inch apart and so placed that the brads of one row are opposite the spaces of the other. Make the boards adjustable by joining them with movable bolts and nail the blocks across the ends with the brads extending upward or outward. If greater length is required, extend the warp between and beyond the brads and wind it about the ends of the frame. For wider work, make an oblong frame with brads at each end. This frame is used by children for weaving raffia and rags. Frames for children's use are cut from heavy cardboard, with small holes made at the ends to carry the warp. Looms for school and home use are kept in kindergarten and school supply stores. Material. No. 60 Barbour's linen thread, 300 ball thread, 36 cotton, or a corresponding size of twist, are used for the warp, and 60 cotton.for the woof. The objection to using silk for the woof is that the knots work loose. Thread wears better if it is waxed. As wax holds the dust it should not be used for white beads. Join threads with a square or a weavers' knot. Use a No. 12 needle and a single thread for fine beads. Reject those that are not of the regular size, such as thick, thin, and uneven ones. Indians prefer the opaque beads. WEAVING. Put one more thread on the warp than the number of spaces required and draw until it is tight. Thread the end coming from the spool and tie the other end to the thread of the warp that is nearest the weaver, string the number of beads for a row, pass the needle under the warp and the beads under and at right angles to it, press one bead into each space with the left forefinger and return the needle through the beads above the warp, so that the thread passes through them twice, once below and once above. Do not draw the thread of the woof tight but press the woven beads against the row above. This makes the texture smooth, soft, and firm, and does not give too much strain on the woof. Illustration 52. Weaving beads, enlarged. Two needles are used for wide bead work, one to carry the beads below the warp and one to pass through them above it. By this means the work can be handled better and mistakes in a line of beads can be easily corrected. The needle that is used to pass through the beads above the warp is used to string the beads for the next row. FINISHING. Fasten the thread by running it back through a row or more of beads. Tie the warp with a square knot in sets of two closely to the last row of beads. Thread one of each set and carry it through or between several of the beads of the texture and cut it off. String each of the remaining threads with the coarser beads to the required length for a fringe, pass the needle back through all but the last bead and fasten the end thread to the texture by two or three button-hole stitches. Illustration 53. 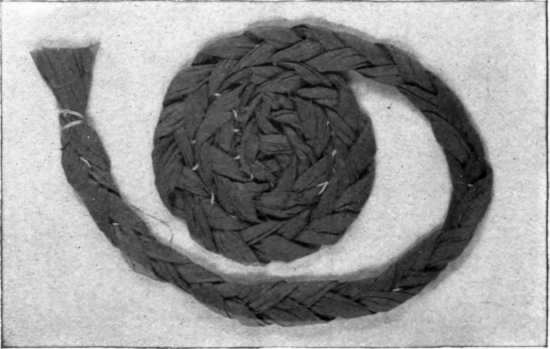 Three ply Raffia Braid.